Wizards of the Coast is pulling out all the stops for Magic: The Gathering’s April 25 expansion, Ravnica: War of the Spark. The latest is a beautifully animated cinematic lore trailer that launched at PAX East over the weekend. In it, a brooding, sinister take on Linkin Park’s “In The End” plays while Planeswalker Liliana Vess turns her army against Nicol Bolas, an Elder Dragon and one of the game’s most popular characters. 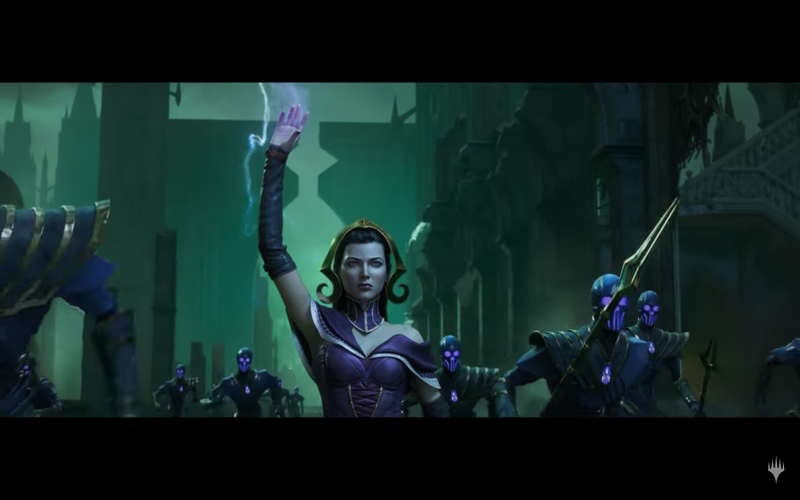 As Wizards of the Coast gears up to rejuvenate the series with some ambitious and controversial moves, the trailer nods at one of the expansion’s most surprising features: War of the Spark features the game’s largest collection of Planeswalker cards to date. Where Planeswalkers were previously some of the rarest, most powerful cards in the game, providing powerful ongoing effects and abilities, the War of the Spark expansion will include a mind-boggling total of 36 Planeswalkers. On top of that, one will be included in each and every pack. That’s a substantial change. Since Planeswalker cards debuted in 2007, each one printed was of the mythic rare variety (the first ones printed were just rare, since mythic rares didn’t exist back then). Since your chances of opening a single mythic rare in a pack are, on average, 1 in 8, and since not all mythic rares in a set are Planeswalkers, you can see why opening a single one used to be such a big deal—and why a future of opening one in every War of the Spark pack is causing such a stir. One Magic player on Reddit found the idea of introducing that much power in a single set so crazy that they wondered if Wizards of the Coast might be jumping the shark. Looking at some of the Planeswalkers in a recent video, the MTG streamer Joey Moss said War of the Spark has the potential to become “the most chaotic set there is.” Meanwhile, the pro Magic player and streamer Kacem “Noxious” Khilaji said he expects to see a slew of cheap spells to deal with Planeswalkers in the next set. When the powerful spell Dovin’s Veto was revealed earlier this week, he even mused that this set might favor creature-type cards in addition to Planeswalker cards, as spells like Dovin’s Veto would make it more difficult for opponents to play their Planeswalkers.